The MineralPRO Ice fridge kit allows the MineralPRO drinking water systems (RO and UF) to supply healthy mineral alkaline water to refrigerators and ice makers. This premium grade Ice Fridge Kit features a 3/8″ tube that supplies the refrigerator—this delivers more water flow with less pressure drop than a standard 1/4″ tube. 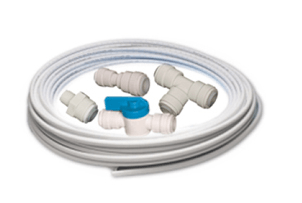 Kit includes all the fittings and tubing required to connect most regrigerators to either of MineralPRO’s drinking water systems.